So, this may or may not apply to some of you out there. But, for those of you that it does apply to I would seriously LOVE to hear your opinions. I found myself a few months into 2013 and realized I needed more of some type of organized system for all of my blogging, other writing, and speaking engagements. A few years ago a friend of mine suggested purchasing a Franklin Covey- and I really haven’t looked back. I keep my Covey with me most of the time and I also keep a desk calendar at home on our counter that I update as needed for my hubby (I like to give him something he can write in, my planner is a no writing zone for him!). In the age of digital technology I find myself being tempted to use Google Calendar. For those of you that know me you know how crazy organized I can be. And I really should have jumped at this years ago. But, there is something about the planner with me and not having to rely on technology to see me through that I just can’t commit to yet. I find my personal calender seemly filled up and before I know it my “work” over takes my empty spaces. Especially when I get this great idea to blog about. I then fill up the space pretty quickly. This year I also started writing down every meal that I cook and whether or not the guys’ like it. It’s my version of trying to come up with a more solid meal plan before Elliette hits Kindergarten. It is really hard to adjust your eating schedule when you have a little one that can’t skip meals! One major thing I realized I needed as my blog has grown over the last year is some type of “editorial calendar” so to speak. I just happened to google blogging calendar one day and couldn’t believe how popular it was! I gave it a few weeks to kind of get an idea of what I wanted to do. I definitely wanted something basic, very basic. I love structure…but when it comes to my blog posts I want to be able to have an “unstructured” freedom. It only took me about an hour to get a sort of game plan of what I wanted into Microsoft Publisher. I printed it out, took it into town and had it bound, and there you go. I added some tabs so I would know what month was where, and so far I am pretty happy. This is the inside at the start of every month. I wanted an overall picture. 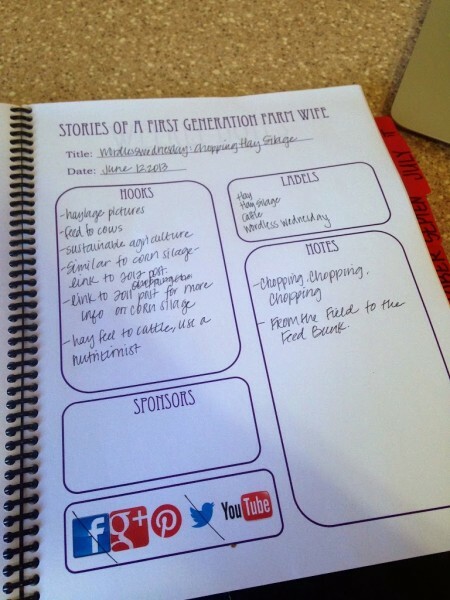 I then had a page for every blog posts to list out all the important things for that post. This has come in really handy when I am sitting in bed at night and don’t want to type a post, just prepare one. And since I loved mine so much I also did one up for my FarmersOnly blogging I do once or twice a week. It has worked really great there. 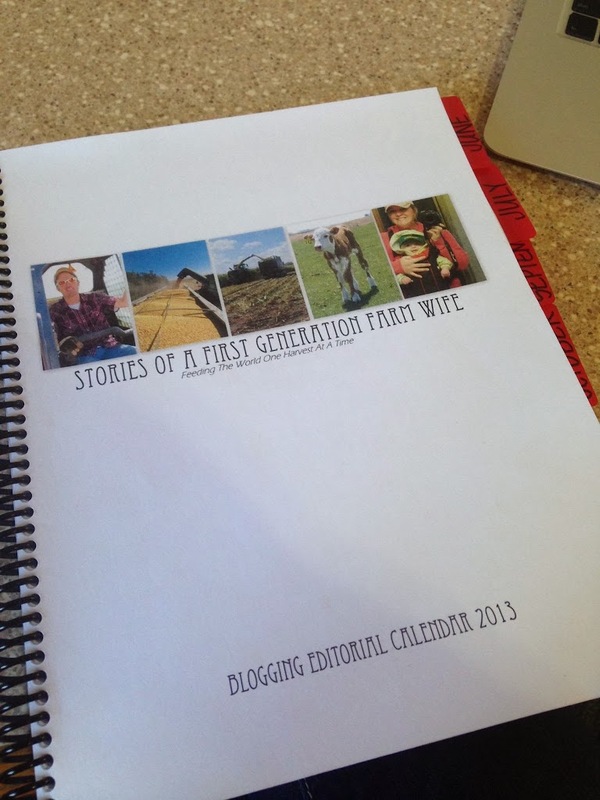 This coming year I will probably add another one for Real Farmwives of America’s blog posts too. I do about eight posts a year for them and I would love to have the brainstorming for those posts in one location. Next time around I hope to do a little more designing, but since I was already oh, six months behind schedule I decided to keep it simple and color coordinated. A basic cover page, with my mid year blogging header on it. Maybe next year I will get a little bit more fancy, but I really didn’t want to take too much time since I was already mid way through the year, and Elliette takes really short naps these days and I knew I was running on borrowed time! 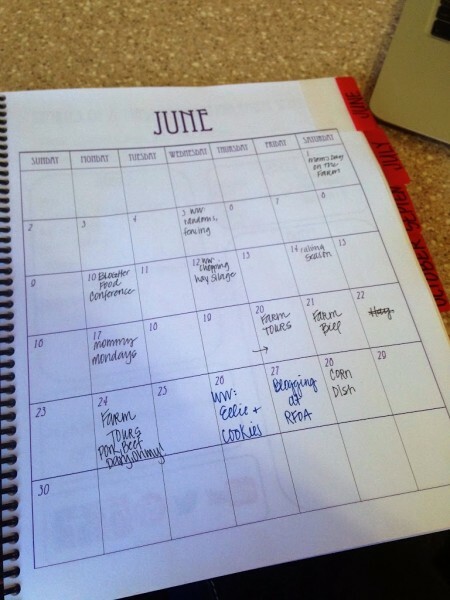 Bloggers out there- What do you use for an editorial calendar? Do you use one at all? And, who uses Google calendars? And are they in love? Do you continue to use a Covey or other planner system in addition to Google calendars? I feel confident in my blogging calendar. Confident in my love of my Covey. Now, to just decide to go digital or not? It would be a really, really big step…but I am getting closer I think! And I only have a few short weeks before the start of the new year, so I better make some decisions! For my blog I have an electronic, word document editorial calendar based on photos I want to take each month that I just continually update, along with things happening, ideas I have, etc. I do use Google calendar which is nice because I can share calendars with my husband and then he can get reminders about events on his phone. And for general to do lists and for notes/ideas I use Evernote. Good luck with all your blogging in the New Year! Love this idea! Thanks for sharing Val! Love Google Calendar! We also have a desk calendar on our fridge that I just fill out when we start a new month based on the events in Google Calendar. I am loving it more and more Dana! However, now that my husband has an iPhone I am really loving the fact that our calendars are syncing together! So convenient! If you are interested in a calendar with lots of room consider investing in a Franklin Covey! Love, Love, Loved mine when I had lots of stuff to write down and even miss it sometimes now that I am not using it as much! What a great idea!!! Truly enjoying your blog here! We just moved from SD to MT down South of Billings on a ranch in the Wolf Mountains! 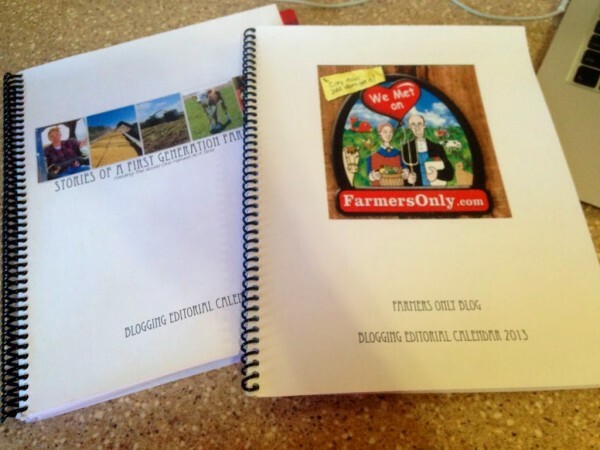 Check out our blog at http://www.themontanaranchadventure.com . Its been quite an interesting change to ranching from the plains of SD to the Mountains of Montana! Thanks Justine- I really loved it this last year and last night I did my new editorial calendar for this year! I am printing today and taking to town to get bound! I love starting the year off fresh with a blank page! PS. I LOVE your blog! It is lovely, and your kids sure are cuties! And how exciting you guys moving to Montana to ranch, and your right…quite the difference! Hope you had a wonderful holiday! I look forward to reading more!